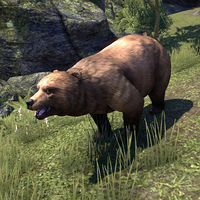 Bears are large, hostile creatures found across Tamriel. They will attack if you are infringing on their territory, and will always roar or growl in an effort to intimidate potential threats before attacking. Bear carcasses can sometimes be harvested for cloth scraps that can be refined for use in crafting. A heavy swipe that staggers the enemy and causes physical damage over time. This attack can be blocked to set the enemy off-balance. A melee attack that does moderate physical damage and knocks the player down as indicated by a red cone. A basic melee attack that hits twice for moderate physical damage. The bear gains CC immunity for a short time after using this skill. The Grip of Madness: Discover why a town's citizens are killing each other. Bleakrock Isle — A small, barren island in the sea northwest of Morrowind, just to the south of Solstheim. Eastmarch — The easternmost hold in Skyrim. The Rift — The southeastern hold of Skyrim. Wrothgar — A region situated in northeastern High Rock, north of Stormhaven. 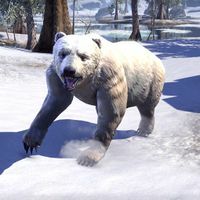 According to the Bearclaw Mine loading screen, the Black Bears of High Rock are much larger than their brown or white cousins. This page was last modified on 6 October 2018, at 18:32.